So, this weeks, let’s discuss all things unicorn. It seems fitting to kick off with some wisdom for the Zen Master of Unicorn Farming himself, Mr. Steve Blank. Steve put out a good post on the path to hypergrowth this week. As is his style, it is framed as a ‘conversation with an old student’. In Survive the Leap to Hyper-Growth, Steve talks about the hypergrowth playbook, or, “Unicorn, Like Me”. I reminded Patrick that the reality is startups are inherently chaotic. As a founder, he got the company to the Build phase because he was able to think creatively and independently. Conditions on the ground changed so rapidly that the original well-thought-out business plan became irrelevant. He managed this chaos and uncertainty, and took action rather than waiting around for someone on his board to tell him what to do. His decisions kept his company from dying. Now Patrick would have to pivot himself and the company. During this Build phase, he was going to have to focus on how to thoughtfully start instituting things he took for granted during the Search phase. He was going to have to build in organization training, hiring standards, sales processes and compensation programs, all the while engineering a culture that still emphasized the value of its people. Long-time successful Unicorn hunter (VC) Bill Gurley warns against investing in the pre-IPO Unicorns. For many reasons, the late stage hypergrowth companies are very different from the companies that have gone public recently. The first critical difference is that these late-stage private companies have not endured the immense scrutiny that is a part of every IPO process. IPOs are remarkably intense, and represent the most thorough inspection that a company will endure in its lifetime. This is why companies and their board of directors agonize over whether or not they are “ready” to go public. Auditors, bankers, three different sets of lawyers, and let us not forget the S.E.C., spend months and months making sure that every single number is correct, important risks are identified, the accounting is all buttoned up, and the proper controls are in place. Conversely, these late stage private rounds have no such pageantry or process. There is typically just a single PowerPoint deck presentation. Slack is not Zendesk! Not yet. Jay Samit (at the wsj.com, no less) reminds us that all bull markets end, and the SaaS bull market will end as well. When the bull run ends, it is exactly the same Unicorns that get slaughtered first. The economic transformation of SaaS is a very real and permanent change. Being a leader in that transformation is promised to no one. Finding the balance between being aggressive and being greedy is an art, and it’s an art all SaaS businesses and investors must learn to practice today. Kobalt – $60 M Series ‘C’ on February 26, 2015. Branch Metrics – $15 Million Series ‘A’ on February 26, 2015. Exablox – $5 Million Series ‘B’ on February 19, 2015. LeadDesk – $8 Million Series ‘A’ on February 12, 2015. Coverpage by Squarespace – Make gorgeous single-page websites in minutes. Scribe Writing (formally Book In a Box) – Book writing and publishing as a service. Do by IFTTT – The fastest way to turn a web page into a table of numbers. Thrust – Find any email at startups. April Dunford published a revised version of her wonderful Startup Marketing Framework. Omri Erel lays out several useful strategies to improve your product adoption processes, How to Strategize Training on the Road to Adoption. Jason Lemkin points out the you customer acquisition costs are determined by the competition you chose, In SaaS, Your Burn Rate is Muchly a Function of Your Chosen Competition. Implementing Customer Success this year? The Guide to Developing a Business Case for Customer Success will help you achieve your customer success mandate. 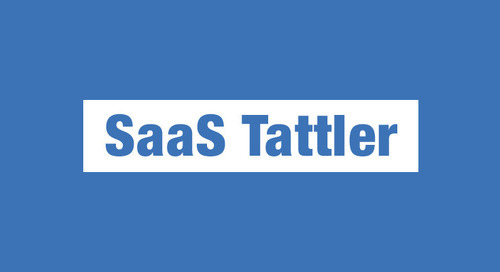 #SaaS Tattler Issue 47 - SaaS Unicornicopia w/ articles by @sgblank, @bgurley, @JaySamit and more! Is it me or are the semantics of a customer success lifecycle confusing?